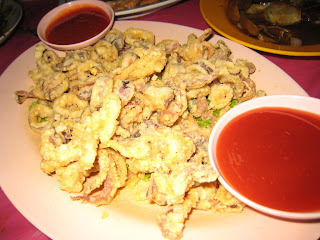 I'm sorry if I'm making anyone drool, I just cannot help it but took the pictures of all the dishes that we had eaten during the Tangkak trip. 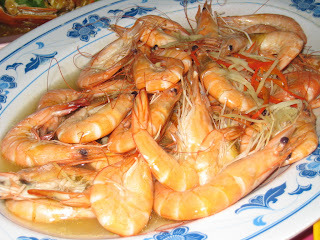 There was a total of 9 dishes, I only started to take from the 2nd dish. 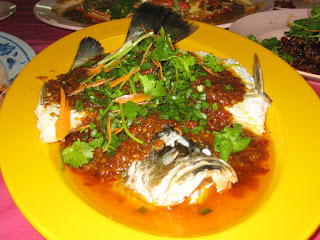 The first dish was Sambal Kang Kong :) below are the rest of the 8 dishes, enjoy! 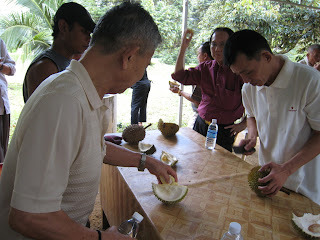 Organised by WP Welfare committee, a bus of about 42 durian lovers made our way there enthusiastically. 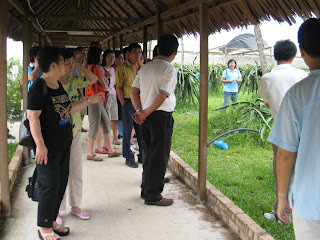 We were travelling with Superior tour which of course provided us with a tour guide in Malaysia. 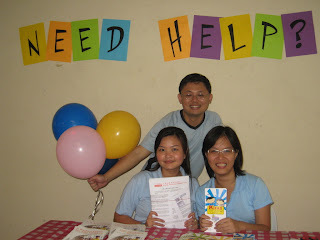 But in Singapore, we have our very own Milton, a WP Welfare member. He did a good job in settling everyone down, he was talking non-stop, hahaha! We had breakfast at the famous Ah Koon fishball and next we proceeded to shopping. By noon we were heading for Tangkak. Its a very rare sight, something that we will not find in Singapore now. 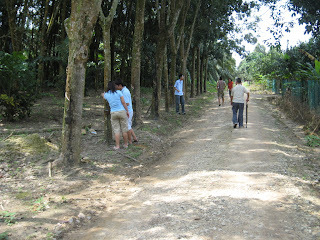 The picture on the right is the path-way that leads to the durian farm. Rubber trees as well as pomelo trees filled the stretches of the path. 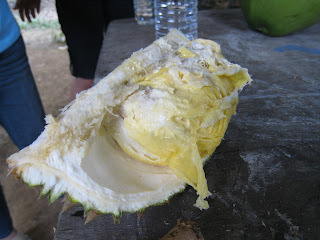 The whole stretch of path was filled with the aroma of the durians...and when we finally reach, goodness! There were so much durians! Whatever type you name it, they have it. 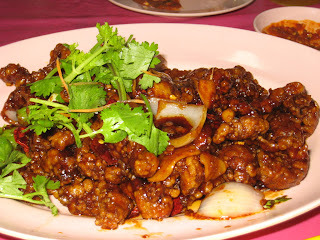 We were also served with fried noodles with wild boar meat...which is term as a pest in this farm. Coconut trees could also be seen. Some of our members helped themselves to the refreshing coconut water. 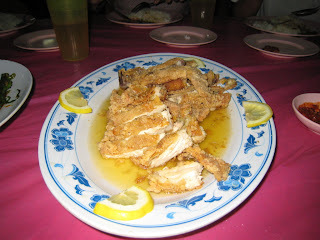 I tasted so much durians that I had no idea which was which, all were fantastic to me :) We also had fried yam which was specially prepared for our group. 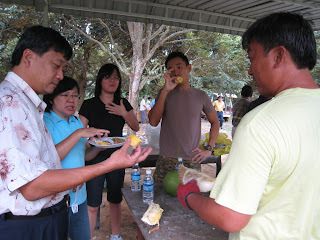 We left the durian farm with heaps of durians to be taken back to Singapore, I bought a packet too. 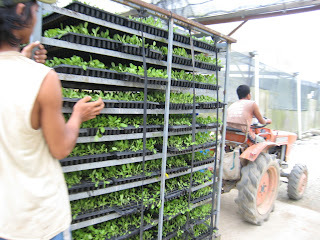 Next we went to a really gigantic organic farm, where farming techniques were introduced to us. 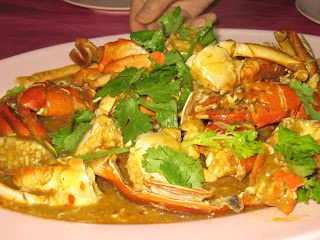 We had sumptous dinner at a kelong seafood restaurant. The place was really authentic, however the night scenery was not that fantastic. 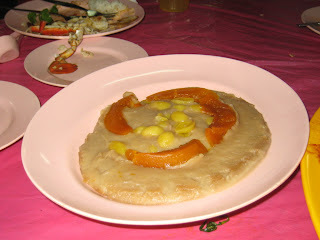 But the food served was not disappointing at all, we had our filled and were soon making our way back home. At around 9pm we were caught in a jam which leads to the custom. By the time we cleared the custom and reached Singapore, it was near to 12am! A friend recommended ODEA to me and I was browsing though it this morning. And I stumbled upon this. For the benefit of those who are not aware, a GE 2006 Post Mortem Session moderated by Chandra Mohan was held in NUSS (The Graduate Society) on 23rd May 2006, shortly after the elections. 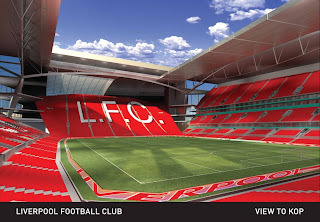 Liverpoolfc.tv had also asked for feedback, reactions and thoughts of the new stadium from fellow Koppers. Needless to say, the fans had rated the design for this new 60, 000 capacity stadium a perfect 10! Scheduled to open in 2010, the 60,000 seat stadium has been designed to allow for future expansion. 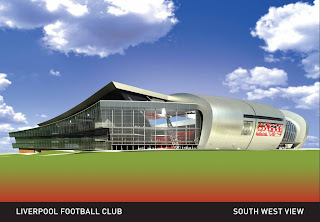 The stadium represents an investment of around £300 million by the Club in North Liverpool. Captain Steven Gerrard said: "To be honest I knew it was going to be great but after spending five minutes looking at the plans I was just completely blown away by it. We are Liverpool Football Club and we expect the best and this will be the best. I've played in some special stadiums but this is something special and it's so important that we are not seen to be copying off another club." "Everyone is excited by the new plans. They are spectacular. 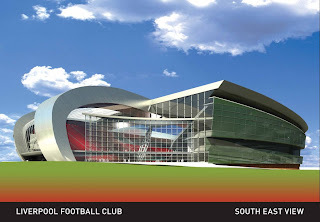 We've got a great stadium at the minute in Anfield, but the designers have come up with something completely unique. I've never seen a football ground like it and that's what makes it so special," Jamie Carragher. Rafa Benitez added his voice of support to the new stadium design: "The facilities the new stadium will provide are going to ensure that the future of this club is a great one and this is what our fans deserve." 23 South Koreans (18 women, five men) were abducted by the Taliban in Afghanistan on 20th July. The group includes doctors and nurses who went to Afghanistan to provide their medical services for humanitarian purposes. Filled with passion and idealism, these people were trying to make a difference. However, things turned out otherwise. One of the hostages had been killed. They are demanding that eight of their jailed fighters be released, or the remaining hostages will be killed. The fate of these hostages is a huge uncertainty. I hope you can join the millions of Koreans and people around the world in praying for the safety of this group of people. Move aside Taiwan, Burj Dubai will be the world's tallest building after its construction which started in Dec 2004. It will stand at 512 meters (1,680 ft) tall. 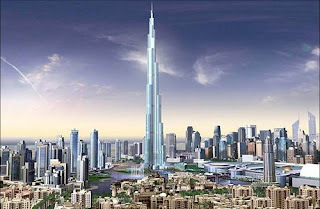 When completed, it will be the tallest architectural structure in the world at about 800 meters (2625 ft). The tower will be situated on a man-made lake which is designed to wrap around the tower and to provide dramatic views of it. Engineers working on the design considered installing triple-decker elevators, which would have been the first in the world. The realized building will use double-decker elevators. The top of the building will contain a public observation deck and a private club above that. The official height has not been released, and remains secret. The total height of 808 meters is subject to change. Everyone should be insured with a Shield plan but how much do you know about the one you are holding onto? The CPF provided us with Medishield and the private insurers that has Shield plans will include; Prudential Pru Shield, AIA Healthshied, Great Eastern Supreme Shield, Aviva Shield and NTUC Income Shield. Each individual can only own one Shield plan. Therefore, if you already have one and you purchase another one, the old one will be taken over by the new one automatically. It is important to note the differences among the many types of shield plans available in the market. Never make the decision on which one to buy by only comparing prices. And lastly the most important thing that one should look out for is the fine prints. I was doing a comparison some time ago and was shocked to find this clause in one of the fine prints that I had read.
" Insured has to inform the company 4 days prior to hospitalization"!!!! Shocking???? How can one has such a clause and I repeat its in the fine prints. This is a BIG unknown risk to the insured. Isn't ridiculous to have such a clause? How can one know when are they going to be hospitalised? Especially if its due to an accident? This group of wacky people includes; Swee Bee, Melvin, Choong Yong, Song Han, Clara, Gordon, Kenneth, Mrs Low, Chong Nam and Benjamin. I'm glad that everyone made a point to come, people like Gordon who never sing came, Mrs Low also came and the less active Benjamin was also present. Anyway as long as its KTV, you will see Benjamin, he is so passionate about singing :) I must say that I was very happy to see Song Han...I had not seen him smile and laugh lately. The highlight of the night came at about 12amplus....I went to the toilet, only to find that the zip to my pants was ruined!!! I had difficulty trying to make my way back to the room. I had no choice but to call Swee Bee who insisted that I must go back into the room NOW... What greeted before me was my favourite dark chocolate cake and a mystery person on the phone waiting to join in the singing of the birthday song. Mrs Low had to send me to Swee Bee's house to change...haha ... this has to be the most embarrassing incident of my life... But I cannot believe that I actually told the gang that, my zip is spoiled and I need to change.... hmm... this goes to show how comfortable I am with this group of people. With that, we ended the session at 3am... this was my last 20s birthday. Next year I will be embarking onto the journey of the 30s :) Thank you guys! Not only do you have to pay, you Pay Until Bankrupt (PUB) . If that's not enough, somebody still Purposely Wants to Dig (PWD) and get more from you. So what more can you do when you are in the Money Only Environment (MOE) ? With the current Mad Accounting System (MAS) , you are forced to Pay the Sum Ahead (PSA) . Which will leave some people Permanently Owing Some Banks (POSB) . And forced to live on the Loan Techniques Always (LTA) system. When you fall sick and happen to be admitted to a Money Operating Hospital (MOH). You might be able to use your Cash Prior to Funeral (CPF) fund. If you are out of luck, you may meet doctors who Never Use Heart (NUH) to treat you. And you will be Sure to Give up Hope (SGH) . To help ease the traffic, motorists have to pay Cash On Expressway (COE) . If that doesn't help,they can always Eternally Raise Prices (ERP) on the roads. Lastly, under all these pressures, there are not many places we can relax, Not even the good old place we used to go because it has become So Expensive and Nothing To See Actually (SENTOSA)!!! This was the reply I got from NEA with regards to my email to them on 'choking drains' at Hougang Avenue 1. Thank you for your feedback in respect of Litters in Drain at 105 Hougang Avenue 1. We have referred your feedback to Aljunied Town Council as the matter comes under their purview. Please call me or email Contact_NEA@nea.gov.sg if I can be of further service. We would appreciate it if you could look into the matter under your purview and reply directly to Ms Lilian Lee. Thank You. Hmm...so what is NEA's duty in this dengue prevention drive? Middle person? Just conveying of messages? Are they not going to do anything about it? Are they not going to send someone down? Or they should call up Aljunied Town Council immediately rather than email! Five years' absence hasn't diminished the allure of Jacky Cheung. While lesser stars would have faltered after such a long time away from live concerts, the Hong Kong crooner showed why he is still the reigning "King of Cantopop" after so many years. At 46, the singer displayed no signs of slowing down as he put up one energetic performance after another on Friday, the opening night of his three-day concert at the Singapore Indoor Stadium. The Singapore pit stop — part of The Year of Jacky Cheung World Tour 2007 which started in February in Las Vegas — saw the "Heavenly King" deliver an assured gig to a mesmerised full-house crowd. The first part of his three-hour concert was all nifty footwork and elaborate costumes, as he belted out his fast numbers. The mood was light-hearted as the star bantered easily with the crowd, taking witty digs at himself. He also sang self-compositions for his elder daughter (he has two) and wife, former actress May Lo, as well as a touching number dedicated to close friend Anita Mui, the "Queen of Cantopop" who passed away in December 2003. Fans were also given a thea-trical treat when the versatile Cheung gave a mini-musical of sorts mid-way into his concert, delivering scenes from his 2005 movie, Perhaps Love.. But it was only during the second half of the concert that the delighted crowd got up on their feet. During the lengthy encore, a dressed-down Cheung showed why no fanciful accompaniments are needed if one is blessed with a mellifluous voice. His solid vocals delivered a string of Cantonese and Mandarin hits, including the ballad Loving You More Everyday. We were doing our weekly hammer sales outreach at Blk 105, Hougang Avenue 1 yesterday around 10.30am. Knowing that we were stepping into the 'black area' marked by NEA for Dengue cases, I took a peep at several drains along the market area. By the way, for people who had been reading the papers...you may have noticed that it is always stated as areas in Hougang are marked 'black areas'. Please be alerted that not all Hougang areas are under Hougang Constituency. Remember it is a single ward, how can it cover such a big area. And this particular place that we went to yesterday was under Aljunied Town Council and thus Aljunied GRC. After seeing that, a call was made to the Aljunied Town Council which transferred us to EMSU because it was not operating on Sunday. The reply from EMSU was... we will send someone to check on it immediately. I fear for the people staying there, especially the elderly and children who had weaker immune system. I also cannot help but wonder....if today this call was made to NEA to complain about this situation in an area in the Hougang Constituency...what will happen? They will send someone down immediately? They are stricter with opposition wards? Then it will probably appear headlines in tomorrow's papers? Hmm....I have no idea... but its something to think about...By the way, I had written this case to NEA this morning, lets see what's their reply and HOW long will they take to reply. The last time I watched his concert was in 2002. Knowing that age is catching up and he is releasing album at a slower pace, I decided that I should catch this concert. As I knew that his concert is always a crowd-drawer I decided to purchase the tickets FAST! I was excited over this concert, he had hundreds and hundreds of songs which I love and moreover, he can really sing. Accompanied by Swee Bee and my sister who is 5 months pregnant, we reached the Indoor Stadium at about 8.05pm. We spend most of our time queuing for our turn to the toilet. Haha...guess what? When the concert finally start the queue disappeared and of course we hurriedly make our way to our $168 per ticket seats. Jacky started with a cantonese song, " 爱火花". After a few fast no. songs, he went in to change into his 2nd outfit. I took this oppotunity to scout around the whole stadium. It was packed, fully-packed with people. People from different countries and ages. The crowd was enthusiastic. Oh, how thoughtful of him to ask the crowd," would you guys prefer me to speak in mandarin or cantonese?" It was later decided by the cheering of the crowd that he should be speaking in cantonese and of course more cantonese songs please. What came as a surprise to me was the input of a 30 minutes musical of " 雪狼湖 " and " 如果爱 ". It was such a fantastic performance that the whole stadium of people were mesmerized by it. The article below was abstracted from The Straits Times, 13th July 2007. PRIME Minister Lee Hsien Loong’s son, Li Hongyi, who is serving his national service, has been reprimanded by the Singapore Armed Forces (SAF) for not following proper procedures in e-mailing a letter of complaint to many other servicemen. Second Lieutenant Li Hongyi had alleged that another officer from his unit, had been absent without leave or AWOL on two occasions. In the June 28 email, which was sent to the Defence Minister and senior SAF officers, among others, 2nd Lt Li also stated that he had reported the matter to the officer’s supervisors, but no disciplinary action had been taken. A summary trial deals with less serious military offences and is normally presided over by a senior disciplinary officer who may serve with the soldier’s own unit or appointed to oversee the trial from another unit. Penalties include being warned by the senior disciplinary officer, fortfeiture of days off or shouldering extra duties. Mindef added that following 2nd Lt Li’s complaint, an investigation was conducted and the officers concerned have been disciplined. The officer who was found to have been AWOL will be court martialled and two supervising officers have been issued letters of warning for poor judgement in administering inappropriate disciplinary action. In a court martial, which deals with more serious offences, can result in a range of penalties if they are found guilty of misconduct. These include discharge from service, detention in the SAF Detention Barracks, a reduction in rank, forfeiture of seniority, fines and reprimand. Mindef issued the statement on Thursday in response to media queries about the internet chatter on Mr Li’s email. Several sites were abuzz with details of the email and comments on how the authorities would respond. Col Lim stressed that the SAF takes a serious view of misconduct by any serviceman. ‘To maintain organisational discipline, all SAF servicemen with complaints or grievances should take them up through proper channels for redress, to ensure due process and to protect confidential information. Mr Li, who is the third of the PM Lee’s four children, has received a Public Service Commission scholarship and will soon be leaving to study economics at the Massachusetts Institute of Technology in the United States. I dont know how to start writing this post, its so difficult, so painful. When I saw how beautiful and adorable 4 year old Ying Ying was, my heart went out to her, her grandparents and her biological father. How can a mother ever do such things to her own flesh and blood? What could have caused such hatred? What can be more precious than your own daughter? I cannot figure it out at all. 4 year old Ying Ying was reported missing by her own mother. The police and public then held a state-wide search for her. Then came another shock, her remains was found wrapped in a black plastic bag. Its a terrible and tragic find. Investigations and interogations were carried out and soon both mother and her current boyfriend confessed to it. Police are still investigating the motive for the killing. At Ying Ying's grandparents' home in Bandar Baru Air Itam, loud sobs and crying could be heard from several doors away. Bayan Baru MP Datuk Wong Kam Hoong, who had earlier offered a RM10,000 reward for information leading to Ying Ying's return, described the news as 'shocking'. I was very disturbed by this incident, imagine Ying Ying is her flesh and blood and yet this can happen. What about children that were adopted? Its hard to imagine... Read more about it from this link http://newpaper.asia1.com.sg/news/story/0,4136,135532,00.html? O – Only we can feel it. K – Knocking out all negativity. R – Relegating the others with our energy. P – Party to our win and have our spirits raised. R – Roaring our way into the crowd. Y – You have a choice! Ok, don't laugh if it does not rythm......at least I tried. He is big, tall, look unapproachable and fearsome. 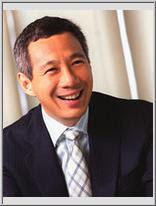 That was my first impression of WPYW President, Mr Perry Tong, when I first met him at WP's Thank You Dinner in 2006. And when I got elected as one of the 6 Youth Wing Exco, I told myself ....hmm... I will be working with this man whom I find unapproachable. Well, I was wrong. He is not as fierce as he looks, in fact not fierce at all. He can be quite crude at times but definitely a very nice person to work with. Because of his built, he got himself this nickname 'Giant'. A compassionate 'giant' I should say. Recently, one of our common friend met with an unfortunate incident. 'Giant' was working as an Operations Manager in JB and hence wasn't too aware of the situation. Swee Bee, Choong Yong and myself tried to help this friend as much as we could. However, the situation got worse without our knowledge. Very coincidentally, 'Giant' was on a month MC, therefore was recuperating at home. He just went through a major surgery. When he came to know about this incident, without further ado, he initiated a mini donation drive. It may not be the best solution but its the heart to help. Quite a handful of our friends responded and were not selfish in their contributions. Soon after that was done, "Giant' called upon myself and Swee Bee to help execute his plans. Not only did he came up with the intention to help, he contributed to the donation and went on to make things happen. All these were done during the period whereby he should be resting at home. As his own vehicle was in the workshop, he also made the effort to lend his sister-in-law's car for convenience purpose. I have to say that I felt very comfortable with this gigantic 'Giant' now and at times I can be quite playful but that does not means that I have no respect for him. I have to salute him for his tolerance level too. Hmmm...Swee Bee and I can sometimes be quite a pain to be with because we were full of crap. HAHAHA! - Any financial industry in S’pore will recognized these 3 papers, eg: banks. - Should one leave the insurance industry, the licensing can still be used in other areas. It’s an asset just like car license. - Courses that Property agents go through are very niche and should one leave, the licensing becomes useless. - You don’t need to possess your own vehicle to sell insurance. - Because sales are normally done either at prospect place, road show or offices. - Imagine you are a Property agent and today you are going to bring your customer to a few spot to view houses. - Are you going to reimburse their taxi fares or take the train with them to the next location? - Anytime one can buy insurance. - When the market is down, it does not affect. Because insurance it’s a long term commitment. - People tend to buy more coverage when times are bad. - People also invest more when times are good. - LIA did a survey and found out that a person will buy approximately 7 policies per lifetime. - When property prices are soaring, people tends to sell. Who will buy? - Vice versa, when market is bad, people buy but no one wants to sell. - In other words, demand and supply does not equate. - Of course, there are exceptional cases. But how often do you find such cases? - And how many properties can one buy in a life time? Unless the very rich, do you have such customer base? - Insurance agents are paid passive income. - They are also rewarded with bonuses at the end of the year plus company’s incentive trips (at lest 3 trips per year). - When they retire, company offer retirement package to them. - Passive income offers the flexibility to choose when to work, especially good for working parents. - People who do not know how to save will suffer from this pay scheme. - One can sell insurance to anyone on the street, buses, trains, etc. - From the young to the old. - Try selling property to a 17 year old chap? - One becomes more money and financial savvy. - One becomes more property savvy. Time flies….Its been a year since I joined as a member of The Workers’ Party. Knowing that every individual effort helps and counts, I do my best to be present at every Hammer Sales which is held once a week. I want to do what I can to help the party, to bring it to another level, to gain exposure and publicity. To reach out to fellow Singaporeans, our Hammer sales team consists of members from all walks of life and from the young to the old. 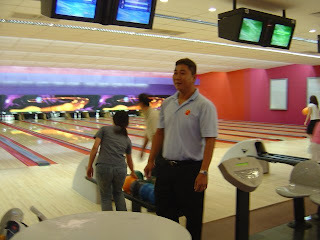 After being elected in the Youth Wing Exco in Aug 2006, our team had also worked together to come up with events such as, collection of old clothes for the needy, bowling session, movie session, outreach programmes, etc. This was done to enhance bonding as well as to show the public that we care. Besides that, Youth Wing also comes up with articles for both the Hammer newsletter and the WP website. We penned down our thoughts and want to show our point of view to the public. I am also a part of EAC (East Coast Committee). This team is lead by Eric Tan. Every fortnight we do our walk-about around the East Coast area. We lend our listening ear to the residents. We also got ourselves some ‘Opinion leaders’ so that we can better understand their needs. With that, we will be writing to Town Councils, etc to help improve their living conditions and/ or environment. Besides doing house-visits, the EAC team will sit down and discuss politics. Present our ideas to the party, help to shape up articles, etc. The most valuable thing I had gain from my involvement is getting to know a bunch of fun people. Never would I thought that I will have friends age 50s and 21....but in the party I did, given that I am nowhere near these two age band. From here, I also met some old school-mates and have more friends from different races. I will continue to contribute in whatever way I can to the party and is looking forward to the next election confidently. My intuition tells me that, the next election will be an even more exciting one. With members of better caliber joining the party, I am quite certain of that. Remember, women tend to have that 6th sense. 1st July 2007 has to be one of the earliest Sunday I have ever woke up on. I was up and running around the house at about 5am and by 5.30 am, I left the house together with my parents and their group of friends to Hougang Ave 5. 8 buses of 40 residents each were off to Muar for a one-day trip. Again this is an annual event held by HGCC. However this year is special because it happened to be the 1st Wedding Anniversary for ermmmm... the best friend I had in the party since I joined Workers' Party last year. Why best friends? Friends are easy to come by but to have one that you can trust on takes time. We may have known each other for only a year but through the experience we had when we work together for party activities, we knew each other more. Swee Bee is the same age as my younger sister and coincidentally we were from the same secondary school too, together with another party member, Song Han. She trusted on me to get things done and vice versa. By the way, she is my senior in the party :) having joined the party 3 years before me. We may serve different committees in the party but that does not deter us from working together. In fact, we work together very often and actively. Choong Yong is another member that I had worked closely with. 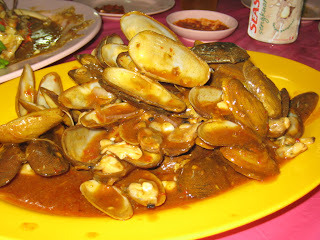 But let's not let Choong Yong take the limelight here since the main character of this post is Swee Bee, HAHAHA! I was not able to share her joy last year on the most important event of her life. 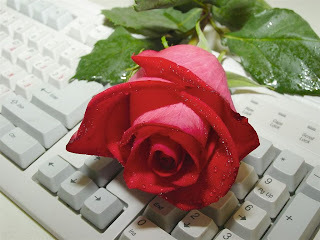 So here I am conveying my wishes through my blog.
" SWEE BEE, HAPPY WEDDING ANNIVERSARY, TOGETHER WITH MELVIN, YOU WILL HAVE MANY MANY MORE YEARS TO GO!"